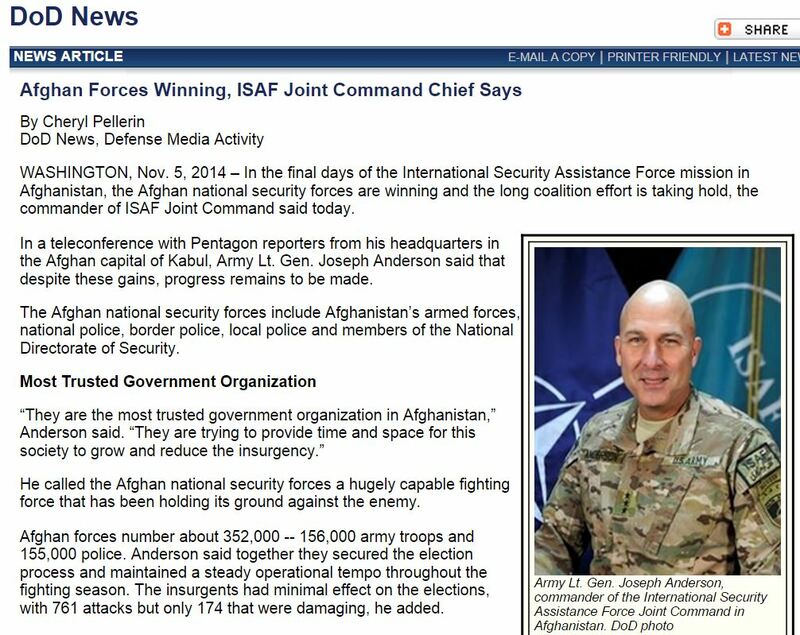 WASHINGTON — At the current casualty rate, the Afghanistan National Security Forces cannot be sustained, according to a top officer within the international coalition. 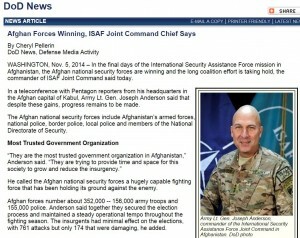 Since the beginning of 2013, the ANSF have suffered almost 9,000 fatalities, U.S. Army Lt. Gen. Joseph Anderson, the commander of the International Security Assistance Force Joint Command, told reporters at the Pentagon on Wednesday. In comparison, the U.S. has lost 2,346 troops in Operation Enduring Freedom since the war began in 2001. This was at the end of the interview. After a question on ANA losses General Anderson destroyed all the gran claims he had previously made on wonderful ANA capabilities. LT. GEN. ANDERSON: Yeah, the data — the data I gave you, it was — it was killed in action, 4,350 for 2013 and 4,634 for 2014. Those are — those are killed in action. No, this is not sustainable. So the issue they’re having between attrition, they’re averaging around — their goal is a 1.4 percent AWOL rate between the army and police. The army’s gone down some. The police have gone up some. But the bottom line, their first priority right now is to get their recruiting back up and to — you’ll hear lots of talk about organizational restructure, the tashkils, make it to the — which is their manning document, to get their manning document filled to their numbers. The police are about 89 percent and the army is about 81 percent fill. Right up front, the Afghan national security forces are winning, and this is a hugely capable fighting force who have been holding their ground against the enemy. Yet another Petraeus, lying his boots off. Can’t somebody say something? Come on, gang. Not a big deal. The post has gotten at least 20 tweets. And it is hitting the desired audience. The author of the DoD News article followed me on Twitter this afternoon. Here’s the interview, BTW, which I neglected to link.